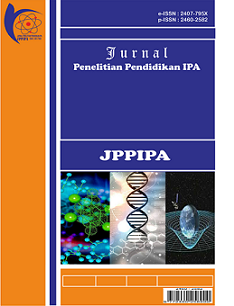 Jurnal Penelitian Pendidikan IPA (JPPIPA) - Journal of Research in Science Education (e_ISSN:2407-795X, p_ISSN:2460-2582) published by Master Program of Science Education, Graduate, Mataram University, contains scientific articles form of research results that includes science, technology and teaching in the field of science. Journal of Research in Science Education is published twice in a year in the January and July editions. Authors across the globe are welcome to submit their research papers in the prestigious journal fulfilling the requisite criterion. Journal of Research in Science Education Colaborate with: Mataram University and Perkumpulan Pendidik IPA Indonesia. Journal of Research in Science Education is OPEN ACCESS.